Kilsyth Rangers got the points they needed with a 3-0 win at Blantyre Vics on Wednesday evening to keep them on track for a promotion spot. Rangers’ fate will now all come down to their final match of the regular season, at home to bottom of the table Irvine Victoria on May 27. Boss Keith Hogg again had to field a weakened side with several players unavailable, but after a nervy start a fairly comfortable win resulted. Rangers started quite well and were soon getting into into the home goal area. Paul McBride had a shot hit the base of the post and just a couple of minutes later Liam McCroary put a decent effort just wide. Blantyre also had a few attempts on goal and Andy Carlin made a good save, turning the ball round for a corner. Fraser Allan also took a dive in the box but the referee was not impressed. Back at the other end another Paul McBride effort just skimmed the crossbar, the big striker having no liuck so far. The goal just had to come and it seemed that it would when a Scott Davidson shot hit the crossbar. But eventually Kilsyth got in front, almost on the half-time whistle, when Davidson finished off a fine piece of attacking play. The goal had settled Rangers nerves somewhat and they looked much more assured in the second half. A few more chances came and went until just on the hour mark when Paul McBride picked up a loose ball, rounded the keeper and tapped in to make the scoreline look much better. Rangers made changes going into the final quarter with trialist A Davidson coming on for Diack. McGlinchie and finally the other trialist, McLaughlin, came on in the final stages and it was the latter who added a third goal well into added time to seal a comfortable win on the night. 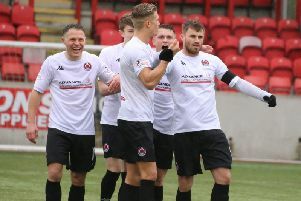 The victory leaves Kilsyth second in the table, but by the time they play their final match current leaders Clydebank and third-placed Rutherglen Glencairn will have finished their programmes, giving Rangers a clearer picture of what will be required against Irvine Vics.